I’m in love with a cantankerous old crone named Ramona Red Wolf. Don’t ask; I’ll explain later. I ran out to pick up the new novel, Shidoshi: The Four Ways of the Corpse for a couple of reasons. The book is written by an old chum of mine named Gordon Richiusa, whom I know to be a hell of a writer, and the story is about ninjas. Now, I’ve never been very interested in karate, kung fu, boxing or any of the zillions of creative ways man has come up with to smack each other around; martial arts movies either send me into peals of derisive laughter or uncontrollable fits of ennui. For some inexplicable reason, though, I’ve always nursed a curiosity about ninjas. I think the hook was baited by Tiger Tanaka’s ninja academy in “You Only Live Twice,” then gradually set by a number of movies I’ve seen through the years depicting those slithery, black-garbed enigmas. I hoped this book would give me the non-Hollywood skinny on these guys. Shidoshi not only satisfied my ninja jones, but also turned out to be a good read. One part primer on “ninjutsu”– the history, credo and deadly fighting style of this secretive warrior class — and two parts adventure, Richiusa’s first novel is as informative as it is entertaining. Set against a 300-Year Plan to unify the internationally fragmented ninja clans, Richiusa contrasts modern day characters, settings and weapons against the methods and mores of old Japan. Essentially, Shidoshi is the story of a showdown between the rightful-though-reluctant heir to the title “Shidoshi,” leader of the unified clans, and those who would do anything to keep him from ascending. 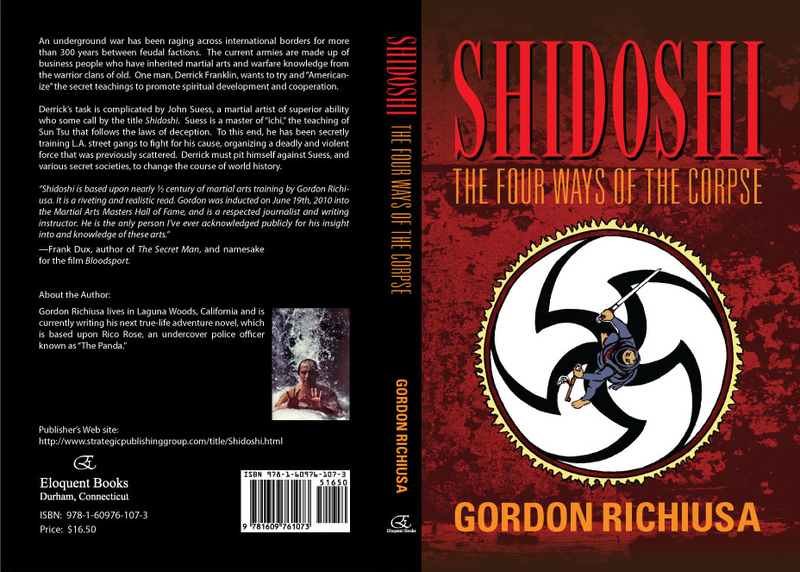 Though told with a liberal dose of humor and quirky characters, Shidoshi’s epic scope and unbreakable connection to the past are constant reminders of its gravitas and the high stakes of The Plan. The story is loaded with left turns, as one might expect from a tale that begins in Los Angeles, excurses to Okinawa and winds up on a windswept Hopi reservation in southwest America. Which brings me to Ramona Red Wolf. A kind of Auntie Mame-meets-Ma Joad wrapped in a snaggle-toothed, octogenarian, Native-American body, Ramona Red Wolf is indicative of Richiusa’s ability to bring eccentricity to credible life. As one of a group of equally interesting and well-drawn mentor ninjas, Red Wolf whips her charges into shape with a mixture of raw humor and perfectionism not seen since Mr. Niagi got the Karate Kid to paint his fence. Red Wolf’s quirky persona is a good example of what makes this novel unusual and entertaining. Shidoshi is a book of contrasts. It gives us old Japan in a modern wrapping, Asian lore and fighting styles on an American Indian reservation, and a deadly serious and precise battle waged by imperfect, sometimes hilarious, characters. The main characters’ devotion to The Plan is a given; their offhandedness and humor actually serve to heighten the plot’s stakes. An internationally recognized martial arts instructor and recent inductee into the Martial Arts Hall of Fame, Richiusa brings authority and credibility to Shidoshi. His non-fiction writing on Carlos Castaneda and Native Americans also helps to flesh out lovely Ramona and her milieu. In other words, Richiusa knows his way around a sweat lodge as much as he does a dojo. I must admit, I approached this book with dread. If 90 minutes of martial arts on screen can make me scream for deliverance, what would 300 pages of karate chops and “bruising on the inside” do to me? Not to mention, it was written by an old friend. What would I tell him if it stunk? Thank heavens, Shidoshi: The Four Ways of the Corpse proved to be a font of ninja info and a well-told story. Note to publisher: Watch those damned typos and punctuation lapses, guys!